True to its word, the online casino games developer, Play 'n Go has kicked off 2019 with a powerful new slot game. Raging Rex is the first of 40 new slot games that the group has promised to release to partner online casinos this year. As such, if Raging Rex is an example of what’s to come, players are in for a treat! 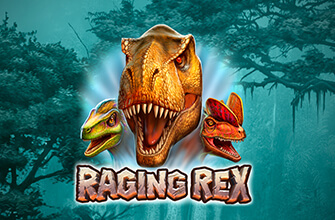 The exciting new Raging Rex slot is Play 'n Go's first release of the year, taking players on a prehistoric adventure with lots of rewards in the wings. According to the chief executive officer of Play 'n Go, Raging Rex slot is an excellent title with which to start off the year. "2019 is a big year for us, with 40 games planned for release, it's important to start off on the right foot and set the correct tone," he said. "Raging Rex is an entertaining and visually stunning title that players love, and it shows the industry the kind of high quality they can expect from us over the next year … and beyond!" Play 'n Go's new Raging Rex slot stars the fiercest dinosaur of them all; the T-Rex. This isn’t your traditional dinosaur-themed slot game. The feature-rich game boasts 4,096 pay lines over 6 reels, with non-adjustable pay lines. Start wagering at just 10c a spin and put yourself in line to win the top jackpot of 5,000 coins. The game boasts high quality graphics and very realistic sounds to make it a particularly engaging title. The main bonus feature in this new slot game by Play 'n Go is the free spins mode. During the base game or the free spin mode, players will get an opportunity to activate the Raging Rex feature with a stacked wild that lands on the reels. The Raging Spins bonus awards free spins (up to 30) or re-spins, as well as the start of either the Primal Rage or Wild Hunt features. The Wild Hunt Bonus earns you wild multipliers of up to 3 x, while the Primal Rage earns you a wild reel on each spin.